I’m working with my webhost to migrate over to a new server. I’ll spare you the boring details, but it will enable me to incorporate some nifty new design elements on this site. It does, however, mean that this site will probably go dark for a little while during the migration period. I have no idea when it will start or how long it will last. I’ll update as more info comes in. UPDATE, 2/5/09: Still some work to do, I see. 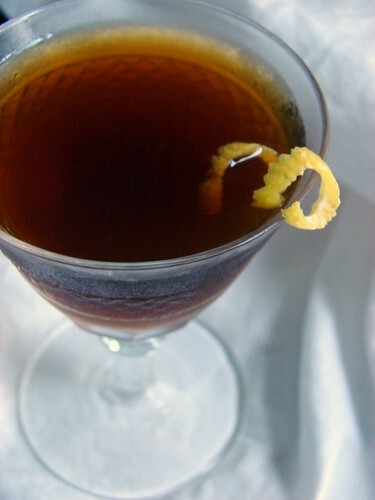 My choice for this challenge features the bitter liqueur Ramazzotti, an Italian tonic that you can sip as an aperitif or a digestif, or even just mix into a cocktail. Now, I’ve had the Ramazzotti on hand for a long time. I bought it in Brooklyn, back before we moved to Rhode Island. My plan was to make a small batch of Jamie Boudreau’s Amer Picon replica. Well, I’ve had the bottle for nearly a year, haven’t made the Amer Picon, and have seen Ramazzotti in local liquor stores. So what’s the point of letting this bottle languish in a box for another year? 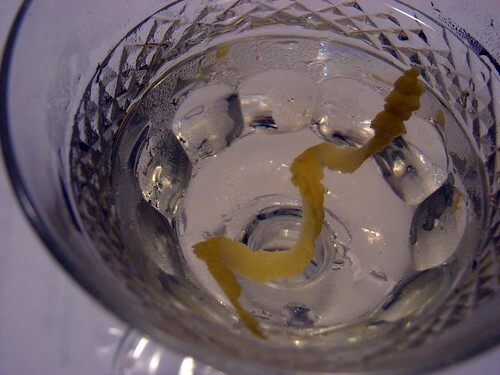 Technique: Stir with ice and strain into a chilled cocktail glass. Add garnish. Yesterday morning, Jen was catching up on her blog reading and asked me, “Have you ever heard of the Ruby Rye cocktail?” I said No, and she said one of the food bloggers she reads had a drink by that name at Gramercy Tavern or someplace. All the blogger said was that the drink had port. I googled and found next to nothing. 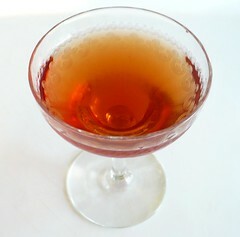 But a drink called Ruby Rye has to also have rye in it, I’d hope, so I decided to wing it. I have a couple of bottles of Sandeman’s port that I received last month for review. I didn’t mix with them at first because I wanted to sample them on their own. Jen and I always like to have port on hand for Christmas and New Year’s, and so the arrival of the Sandeman’s was very timely. It’s a simple recipe, and although I haven’t named it, I’ll give it to you here anyway. Technique: Stir briskly over cracked ice. Strain into chilled cocktail glass. Add garnish. As if it matters, this photo’s actually my own. I figured I’d take a crack at the pretty picture-taking myself for once. Sandeman’s Founders Reserve Port, Stichelton blue cheese, and walnuts. Photograph by Jennifer Hess. Blogroll + Google Reader + WordPress = Easy! As I was redesigning this site, I wanted to make the blogroll a priority. It had been dramatically out of date for months. One thing I wanted to do was link it to my Google Reader account, so that whenever I add a feed to the Booze section of my account, that feed will automatically appear in my blogroll. Same thing for deleting feeds. It’s annoying to have to manage your subscriptions in two places–in your feed reader and in your Links panel–and it makes it difficult to keep your blogroll up to date. Log in to your Reader account. In the top-right corner, choose Settings. Once it’s public, you should have an option that says Add a Blogroll to My Site. Click that. You should see a pop-up window with your new blogroll. For my site, I deleted the default title that Google provided and I changed the color scheme to None, so that I could control the title in WP and let my own custom CSS styles govern the presentation. Copy the code from the box. Switch to your WP admin panel, go to Design, and choose Widgets. Create a new Text widget and paste the code into the widget box. Title your Text widget with whatever you want–in my case, Bartenders and Cocktail Nerds. Save the new widget and then click Save Changes. I’ve been too lazy to add you to my Reader account. If you’re a cocktail or spirits blogger, you want on this blogroll, and you’ve updated since, oh, October or so, drop me a comment here and I’ll try to add you. As promised/threatened, I made the Ford Cocktail that Ted “Dr. Cocktail” Haigh recommended on NPR’s Weekend Edition Sunday. Doc said to Liane Hansen that this is a drink he wants to revive in 2009 and rightfully so. It’s delicious. He describes it as lovely and beautifully balanced, and once again, the doctor’s prescription is right on the money. I’m happy to do my part. Although the only source Haigh mentions is “an 1895 book,” I was able to uncover it with my fancy Google fu–George J. Kappeler’s Modern American Drinks. Technique: Stir over cracked ice in a mixing glass. Strain into chilled cocktail glass. Add garnish. Notes: Doc didn’t actually mention the garnish to Hansen, but since it’s in Kappeler’s, I’ve added it. You can see from Jen’s photo that I used lemon. You might recall that Jen’s allergic to orange. Finally, to address the perennial question–how much is 3 dashes of Benedictine?–I dashed the orange bitters first into my measuring cup and noted the level. I then carefully measured a roughly equal amount of Benedictine.